Renewal for Florida Professional Engineer licenses and firms’ Certificates of Authorization ended Feb. 28, 2019. 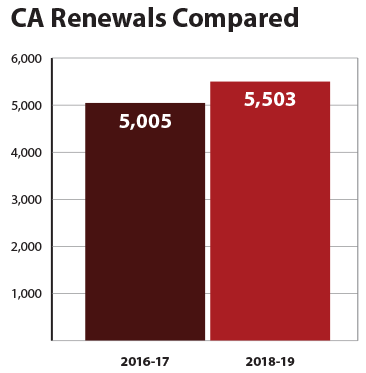 More PE licenses and CAs were renewed during the 2018-19 cycle than 2016-17. For the 2018-19 renewal period, Professional Engineers were offered a chance to save $10 on their renewal fee if they completed renewal by Jan. 15, 2019. The first section of the graph above shows that quite a number of engineers took advantage of the incentive, with almost twice as many PEs renewing their license compared with the previous renewal period when no discount was offered. As a result of that early incentive, there were fewer PEs that needed to renew in the later part of the renewal period (as shown in the middle section above). Overall, 35,783 PEs (including late renewals) renewed their licenses during the 2018-19 period, which was almost 3,000 more than the previous renewal period. Almost 500 more firms renewed Certificates of Authorization during the 2018-19 period. Please be aware, that PE licenses or CAs that had been current but were not renewed by Feb. 28, 2019, are now delinquent and can no longer be used to practice engineering in Florida. A fee of $25 will be applied to currently delinquent licenses or CAs that are renewed prior to Feb. 28, 2021. If the license or CA was delinquent prior to the end of renewal and was not renewed by Feb. 28, 2019, it is now null and void. If you have any questions regarding renewing your license or CA, please call the Board office at (850) 521-0500 and select “Renewal” to speak to a representative.